Synopsis: The second book in the exciting Chronosphere series sees a mysterious malfunction ravage the Chronosphere. It starts slowly at first, with meals being served cold and food going off, then residents start to notice the blistering heat and haywire android servants. Soon the entire Chronosphere is malfunctioning, causing a complete breakdown of society and the eruption of a fierce turf war between rival gangs. Caught in the middle of the crossfire are Raffi Delgado and his fellow chrononauts Dario, Sal, Jonah and Lastara. With the help of familiar faces and old enemies, they put into place a brave rescue attempt, but in doing so the dark truth about the source of the Malfunction and the real aims of the Chronomaster become all too clear. Things are changing in the Chronosphere; a general unrest has taken to the population. Slowly, things start to go wrong. First, the food deteriorates, then temperatures soar, followed quickly by the malfunction of the MAIDs, robotic servants. It’s only when the exits are blocked that things really get critical, and a civil war breaks out. But what if there’s more to the Chronosphere than they originally thought? What is its original purpose? Is there something darker lurking at the heart of it? Chronosphere: Malfunction digs deeper into the true reason for the Chronosphere’s existence- something that was hinted at in Time Out of Time but never truly revealed. The argumentation isn’t particularly new or original, but the time-bending twist is entertaining enough to make Malfunction an interesting read. Alex Woolf manages to pack a lot more action into this sequel, which means that whilst it’s very pacey, there are a few new intriguing ideas being explored in Malfunction; those are what made Time Out of Time stand apart from the crowd (particularly its exploration of robotic and human relationships). One quite noteworthy scene was the very last one in which the wonderful idea of the consequences of time bending meets tragedy and leaves a bitter taste- fantastically so. If it’s any scene worth mentioning, it is this one. 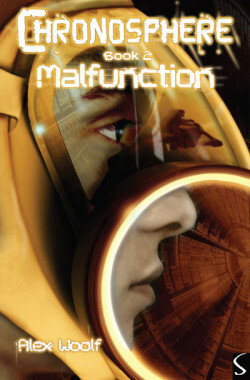 Malfunction still follows the same characters, and many of the female characters featured in Time Out of Time are built upon, making them far more real. Sal, particularly, has changed. She’s still the cynical, quiet, intelligent one, but now she’s on a mission and there is a hint of cold-heartedness that is particularly juicy. None of the characters are notably worthy of merit. They’re all good characters, but none blow your mind away. Chronosphere: Malfunction ups the game in terms of action and plot; and unlike Time Out of Time, Raffi and the group actually do something they shouldn’t be doing, with all kinds of consequences. It’s a shame that it doesn’t further add to the exploration of sci-fi ideas, and this makes it a slightly weaker novel than Time Out of Time. The female leads do get an update in the personality department, and there’s a lot more to them than you may think. Chronosphere is still a trilogy worth reading, and at just over 200 pages a book, you can’t really go wrong.